i haven’t worn these boots since last october on account of them totally slicing my ankles open to the point that i could barely walk. but, after digging around in some shoe boxes earlier, i thought if i taped the back of them they would be fine! going to take flats and plasters in my bag just in case though. i wore this to go to the boys house yesterday even though i definitely regretted wearing pony fur boots in such awful weather. when i left the house it was dry, but by the time i got to his it was a torrential downpour! good job he picked me up from the metro station. we were going to go out for food but decided to stay in and watch some more 24. i’m obsessed with it! i actually put my leather jacket on instead of that vintage blazer as it was way too cold for just a thin layer. 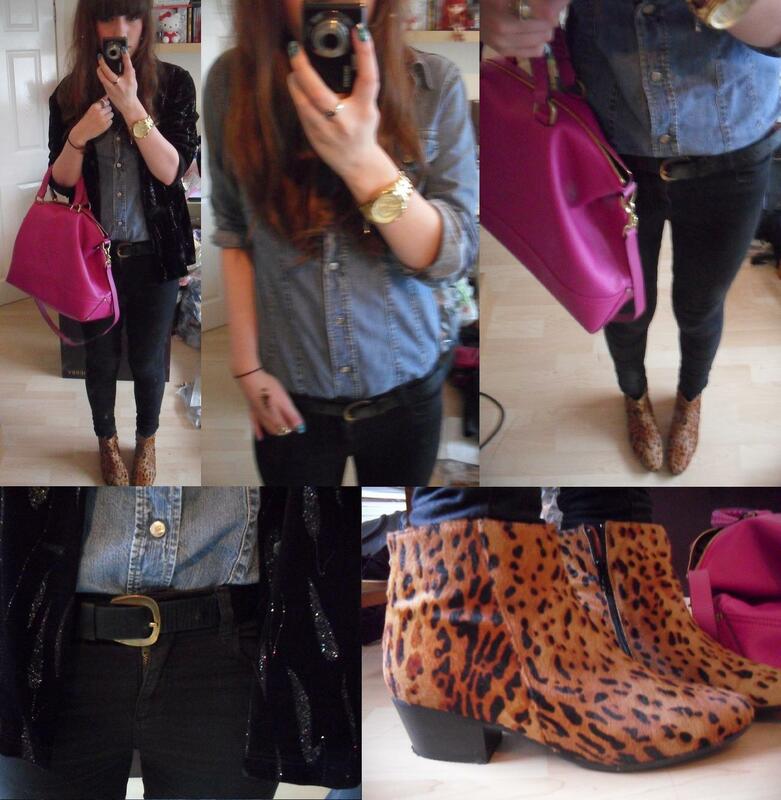 i think i’ll always love the double-denim combo of a denim shirt and dark denim jeans. anyways, tonight i’m going to work through the rest of parks and recreation as it’s hilarious and catch up with some blogs. more stupid photos of my face. woo yeah etc. i never smile on photos, like ever. so this is a rare treat (though probably not so much for you’s, haha, check the bunny teeth). my lipstick is MAC’s girl about town to match my bag. 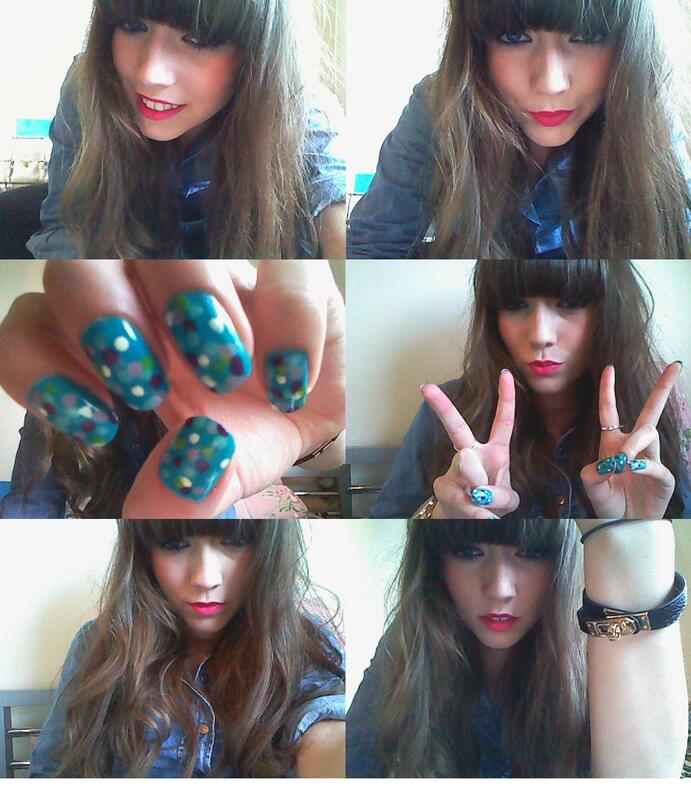 i needed some nail inspiration so i went on to pinterest and found one with lots of polkadots sort of overlapped. they did it in pink and peach tones and i opted for cool tones, using rimmel’s sky high as a base. i think i quite like how it turned out, though next time i’d do bigger dots. my hermes double tour look a like bracelet arrived and i do rather like it. i will probably never own the real deal unless one pops up on ebay at a reasonable price, so this is the next best thing!